A high surf advisory continues for the coast, and you can expect scattered showers over the area throughout the day. 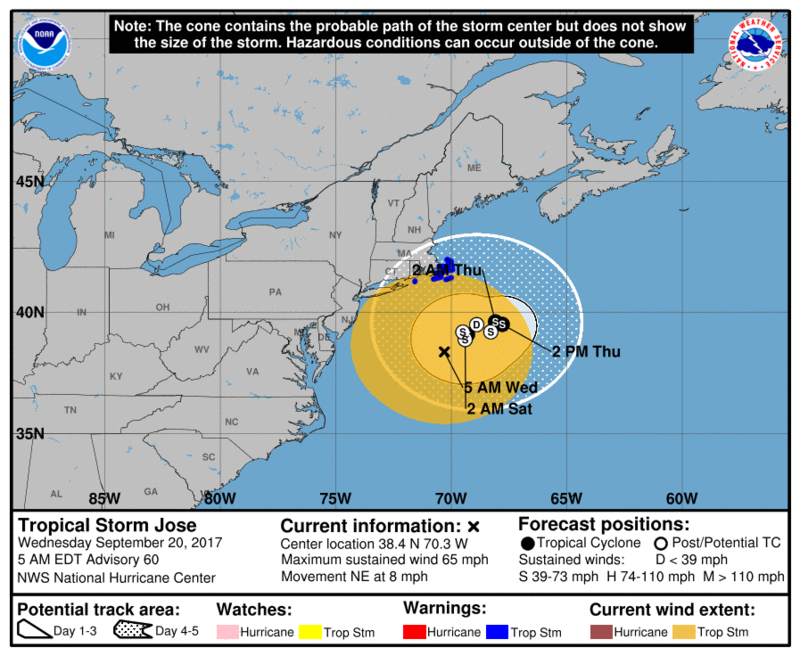 This morning Hurricane José was downgraded to a tropical storm. The track of the storm will take the heaviest winds out over the ocean. A high surf advisory continues for the coast of Maine and if you are headed onto the ocean be extra cautious with the large waves and rip currents. It’s going to be a cloudy day for all of us and there could be scattered showers around the area and – less likely – even a quick tropical downpour. I don’t expect much in the way of total rainfall as the heaviest rain with José stays over the ocean. Winds will be noticeable at times today, but there are no advisories or warnings for wind around greater Portland. There is a small craft advisory for the coast. Another potential issue from the storm is going to be the beach erosion. 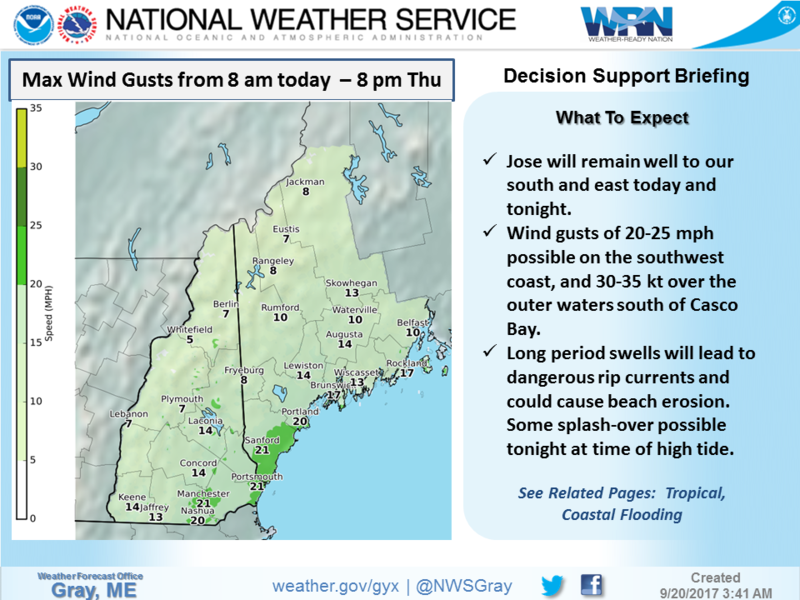 The persistent flow of wind off the water the past several days will continue into Thursday and it may change the shape of several beaches – especially those exposed directly to the ocean. The erosion won’t be major, but when the storm finally winds down I suspect beach sand will end up being the main casualty. Clouds are going to depart early Thursday because the storm will relax its effects on Maine. Look for sunshine to return to all areas and if the clouds linger over coastal York County early, they should clear during the morning. Temperatures will respond quite well and reach into the 70s. If it weren’t for this particular storm it would have been quite warm all week. The persistent easterly flow has kept the warm air at bay. But as the storm pulls away I’m looking for much warmer weather this weekend. The fog that has plagued much of the coast will cease being a factor. Inland areas will reach the upper 70s Saturday and into the 80s on Sunday. Even the coast should be warmer than average this weekend with Portland nearing 80 for Sunday. The eye of Maria surrounded by the strongest winds in a hurricane is passing over Puerto Rico this morning. The image shows the eye on the south side of the island moving north. Some of the strongest winds are now hitting that island. Maria will remain a hurricane and needs to be monitored for any impacts to the United States mainland next week. At present, computer models keep it offshore, but this could change.